Synergy Arts Foundation is excited to be funding an arts program at Vista Hill’s ParentCare Family Recovery Center*. This organization has been helping “high-risk” families break the cycle of child abuse, neglect, substance abuse and domestic violence for over 26 years. By providing drug rehabilitation, parenting skills classes and much more, ParentCare provides families the opportunity to make critical lifestyle changes and create a safe, nurturing home environment for their children. Primary benefits of the art project are to enhance self-confidence, focus and patience and to explore creativity and self expression through different art mediums. Simultaneously, the art classes provide a safe environment in which to relax, have fun and promote building a sense of community through sharing creative ideas and solutions. The primary goal of the ParentCare art program is to provide participants a creative and stimulating opportunity to explore artistic experience and expression. The ParentCare population is primarily mothers and mothers-to-be (18-40) who are in recovery from drug or alcohol addiction, many of whom have come out of Fostercare and some are homeless. Some mothers bring their infants to class while older children are encouraged to participate. The art instructor, Pam Palmer-Lowe, is a professional interior designer with a background in applied design and management, who has generously been volunteering at ParentCare for over 18 months. 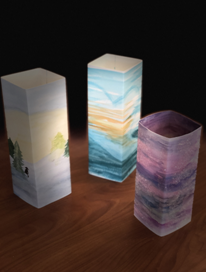 She plans to include diverse mediums for these classes with an emphasis on creating “functional” art objects such as quilted pillows, fabric dolls, wooden jewelry and picture frames, holiday ornaments, special occasion cards and much more. *ParentCare is partially funded by the County of San Diego Health and Human Services Agency. ​Corazon de Vida Foundation (CDV) is a US non-profit organization in its 20th year of operation. CDV helps with funding to orphanages in Baja California, Mexico (13 orphanages), housing over 700 children that rely on its fundraising efforts to survive. its primary focus is fundraising to support the children and strives to be strongly connected to the homes and the children supported. Its funding to the orphanages helps cover life-sustaining needs (food, water, shelter), quality of life improvements and k-12 education. In addition, the organization has a higher education program to help teens that are aging out of the orphanage system continue their education in college or technical schools. Rancho El Faro is one of the orphanages supported by Corazon de Vida Foundation*. The home is located in the Guadalupe Valley, known as the “Wine Country” of Baja, Mexico, due to its growing wine industry. “Rancho” as it is known, is a home for teen girls from 12 to 18 years of age. Most of these girls come from very tough situations and “Rancho” provides their last opportunity to turn their lives around. Most of the teens are able to attend the local public schools to continue their education. On occasion, some of the new teens arrive without proper documents (birth certificate, school documents, etc.) to attend school and can lose months and up to a year of schooling. Synergy Arts Foundation funded two ceramics arts project for a select group of teens. Renowned local artist, Beliz Iristay taught these teens how to make and paint ceramic coasters. These were sold to visitors at some of the wineries in the area as well as at the San Diego Art Institute gift shop. In addition to the revenue realized from this project which will help cover some of the home’s needs, the teens also benefit from having Beliz and her team of volunteers serving as mentors and role models and the project provides activities to help keep them engaged and enhancing their self esteem by feeling productive. Synergy undertook another project with Beliz Iristay at Rancho El Faro. She worked with a select group of teenagers to create their own veladoras. Each student made one for herself and an additional one. These were sold and the funds were given back to the orphanage. Synergy also worked with students at the largest orphanages in Baja called Rancho de los Ninos. 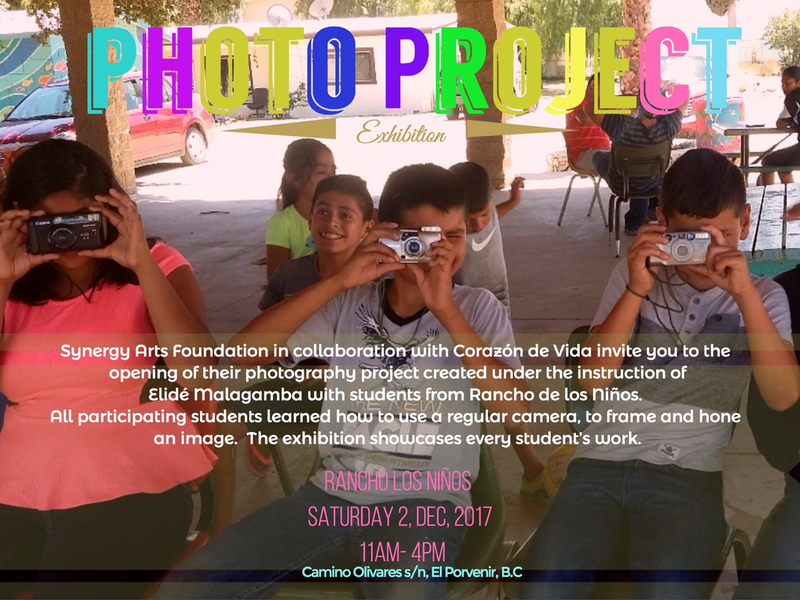 The instructor, Elidé Malagamba, a local Baja photographer, taught these children how to use a 35 mm camera, and how to compose and frame photographs. Classes were held every Saturday for a month and students were motivated to explore photography and experiment with their cameras throughout the week. Elidé reviewed each image taken by each student each week and provided constructive feedback. The objective of this project was to encourage an in-depth knowledge of photography, provide students with much needed arts education, and stimulate their creativity. We believe through this project, each student will have learned not only about composing and framing photographs but also about themselves and their own creative process. This is the third year this healing arts project is being offered by Synergy Arts Foundation. In collaboration with Scripps Encinitas, Synergy Arts Foundation is offering this class free to all Encinitas in-patients and residents who are recovering from any neurological issues, including but not limited to brain injuries, strokes, spinal cord injuries, Parkinson’s disease, and Multiple Sclerosis. The group is also available to those coping with cancer and multiple traumas. The class provides opportunities to enjoy self-expression through art, reduce stress, increase hand-eye coordination, and stimulate imagination and creativity in a comfortable and supportive environment.